I'd just like to take a moment to provide an official update in response to several questions of late about when the book on the first 15 years of home videogames and computers will be coming out (the one that Gamasutra is running excerpts from). As you know, during the time from when that book was first announced 3+ years ago, Matt Barton was able to get his first mainstream book published. Unfortunately, the major publisher for the 15 years book had to pull out simply because it was taking too long to finish and they had their own internal staff changes to sort through (and other financial considerations). In short though, the book collapsed under its own ambitions. Sadly, by the time all of that was worked out and the formula perfected (again, as evidenced by the Gamasutra excerpts), the market for videogame books through normal publishing means (meaning not vanity press, subsidized or self-published) has collapsed, making publishers hesitant to bite on even a 90% completed book with proven content and testimonials from countless people who actually want to purchase it. Review of Matt Barton's book, Dungeons & Desktops (2008), from A K Peters, Ltd. I finally received my copy of Matt Barton's Dungeons & Desktops: The History of Computer Role-Playing Games, and it was definitely worth the wait. Similar to the popular Gamasutra articles Matt wrote and the book was inspired by, the book is broken up into various Ages, such as The Dark Age, The Golden Age, The Modern Age, etc., though in a greatly expanded fashion. This is a logical and effective means of organization and helps guide the reader through the progressively more sophisticated - though not necessarily better - CRPGs over the years. There is plenty of theory and before you get into the meat of the book, exactly what is and what isn't a CRPG is discussed in great detail. For the most part I agree with the definitions and delineations of the various related genres (adventure, RPG, MUDs, JRPGs, etc.) and I believe this can be used as the basis for future works by other authors. In short, the reader gets a clear picture of what exactly the author means by "CRPG" in its many forms and why some of the other games - even though they might exhibit several RPG characteristics - really fall under another classification. My copy of dungeons and desktops came today! 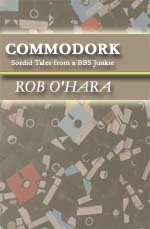 Commodork book coverRob O'Hara's new book, Commodork: Sordid Tales from a BBS Junkie, has recently been restocked and is available again directly from his Website. I just finished reading Chris Kohler's new book Retro Gaming Hacks and I have to say I enjoyed it a good deal. Topics range from how to run a variety of emulators on your PC to how to do introductory level programming for the GBA. While a lot of the information is rather basic, I learned a few things about older consoles and PCs from the book. The writing in here is noticeably better than in Kohler's other book, Power Up!, though part of this might be because large portions of the book are written by other contributors. Kohler's writing is more confident and has a nice playful tone that is not unlike the style of writing done for this very site.